Discoveries in polymer physics and chemistry impact diverse phenomena in biology. Biopolymers, special forms of polymers realized through evolution, can adopt three-dimensional native structures and reshape their conformations in response to changes in external conditions. The basic static and dynamic features of single- and many- polymer systems are central for the understanding of proteins, nucleic acids, polysaccharides, and their complexes. The overall aim of this summer school is to bring together polymer experts from diverse disciplines whose works are linked to polymer science and biology in order to promote the basic science underlying biological materials and living organisms. 1. Basic polymer theories and simulations. 2. Mechanics of nucleic acids. 3. From DNA to higher order complexes and the chromosome. 6. Effects of crowded environment on biopolymers. 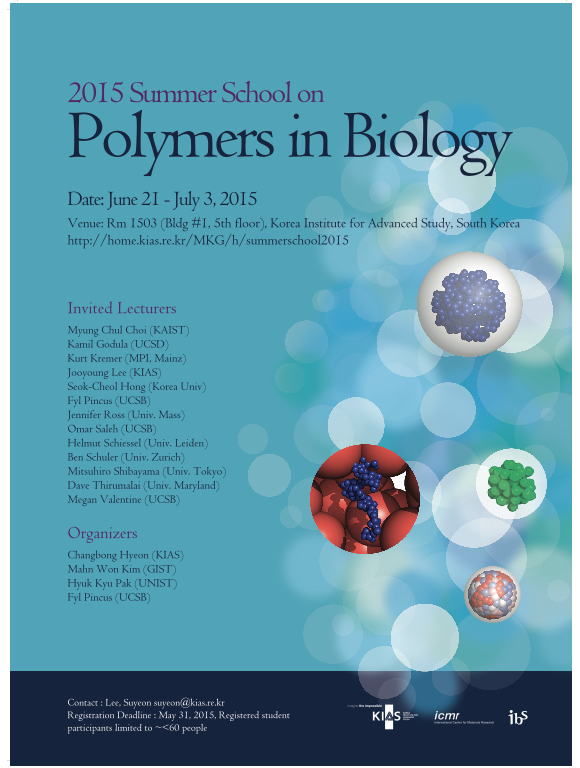 The 2015 Summer School will be organized by the Korea Institute of Advanced Study (KIAS), Institute for basic science (IBS) and ICMR (International Center for Materials Research, UCSB). It will begin with two-day pre-school workshop, in which all the participants will have a chance to present their current work and be followed by the body of the school. The 12 invited speakers will each deliver a 4-hour mini-course on polymer science and their applications to biology. The initial few hours of each mini-course will be devoted to the fundamental, textbook level introduction to basic concepts.